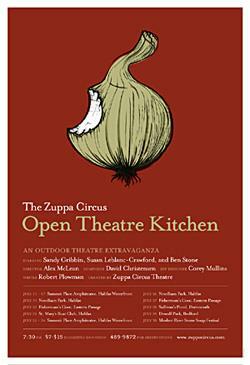 A wild theatrical feast, Open Theatre Kitchen is part comedy, part creation myth, part tragedy, part cooking show. It is the story of two chefs who live alone in a kitchen in a desert. Desperate to combat their loneliness, they cook up the recipe of recipes, the flavour of all flavours … which takes the form of a son. Sample of My Publication on Open Kitchen Theatre: “Dancing with Spirits: Zuppa Circus’s Open Theatre Kitchen.”Canadian Theatre Review 128 (Fall 2006): 20–5.